A true innovation in concealer technology. BECCA’s Compact Concealer cleverly contains two highly pigmented formulations within one slim compact – Extra-cover and Medium-cover. Enabling layering and mixing, this ingenious product provides total camouflage for almost any skin problem including blemishes, scars, birthmarks and under eye circles. An extensive range of 34 colours ensures the best skin colour match even when a heavy application is required, guaranteeing a traceless, natural finish. 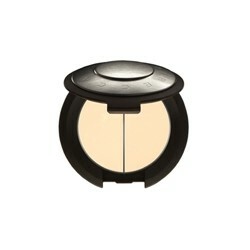 The medium-cover version is sheer and creamy- perfect for dark shadows in the under-eye area. The extra-cover version provides exceptional camouflage and adheres well to the skin.